Primary school enrollment in Nepal has been increasing since the 1990s. The quality of education, however, remains low, as are secondary school completion rates. Inadequate training for teachers, lack of appropriate learning materials, and insufficient support at home prevent children from developing reading skills in the early grades that will allow them to learn throughout their academic career. 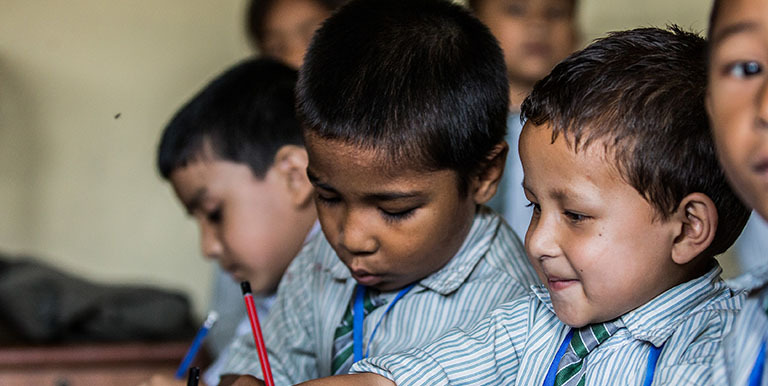 Nepal’s School Sector Development Plan 2016-2023, supported by ADB, was designed to improve access, equity, and quality of the entire school education system. The plan includes the adoption of information and communication technology (ICT) to improve the quality and relevance of education in Nepal. Among the targets is the establishment of 1,000 model schools with improved learning environment, including the provision of ICT facilities. In October 2017, education experts explored ways to strengthen ICT in the target schools and classrooms and discuss potential ICT options for enhancing education outcomes at a workshop organized by the Government of Nepal and ADB. The workshop identified ICT interventions that can lead to better returns for the students and teachers. One Laptop Per Child Program. OLE Nepal, a tech organization, partnered with Nepal’s Department of Education in 2008 on a share-a-laptop program for students. The program has provided more than 6,000 students from remote areas with child-friendly laptops with built-in software. The organization has also designed and developed digital learning materials, trained teachers to use them to enhance student learning, and set up appropriate infrastructure in schools to enable technology-based learning. Currently, OLE’s programs run in more than 225 schools across Nepal and have reached over half a million students who are now benefiting from its digital learning methods. OLE also provides digital libraries, with thousands of e-books and videos through its server to schools in remote areas. Nepali students connected to the Internet can access educational opportunities by joining Massive Open Online Courses that allow students to register for a digital online course offered by various universities around the world. In 2016, Kathmandu University pioneered and implemented open online courses that offered course materials online, freely and openly available to anyone, anywhere. The launch of MiDas eCLASS in 2012 paved the way for more innovations in meeting the educational needs of Nepal students. The website, with its related mobile application, offers curriculum-based study materials, communication tools, and other e-learning tools to students from nursery to grade 10 and to their parents. The KULLABS Smart School website developed by Kul Techno Lab and Research Center digitized components of the Nepali school curriculum, that aimed to replaced bulky textbooks that students carry to school with lighter digital devices like tablets and laptops. The free website makes it possible for students of classes eight to 10 to continue their learning online. Teachers can also use the platform to teach their students more effectively. It is also possible to form an educational community by connecting with teachers or other students or joining a study group. Learning through powerful, hand-held, and networked devices that provide ubiquitous learning environments started in Nepal with the piloting of the Ubiquitous-based Test in 2014 by NSDevil, a South Korea-based organization. The computerized method allows tests to be conducted anywhere with a network connection, and not only reduces the costs, but also reduces carbon footprints. Nine model schools were considered as pilot sites for the two-year initiative, which would benefit more than 800 students in grades 3 and 5, and 19 teachers. The project helped enhance the learning and teaching environments in the model schools and bridged the digital divide between urban city schools and schools in the remote areas. Initiatives to use social media networking sites such as Facebook to engage students and teachers alike are also on the uptake. Teachers in rural villages have begun to actively participate in online discussions. One of these is the Facebook group, Teachers' Discussion on Educational Issues, which has more than 1,500 active members who freely exchange ideas outside their classrooms. Others are engaged in "self-learning platforms" using their mobile phones. Educators in the workshop believe that technology can play a big role in addressing the challenges in Nepal’s education system. While there have been several ICT-for-education interventions, most were project based and consequently stopped when the project ended or were fragmented. Two major factors that affect the delivery of ICT for education services are power supply and connectivity. In Nepal, both these utility services are not readily available outside main urban areas. More schools need to be connected to the grid or alternatives such as solar power should be considered to advance the ICT for education interventions. Meanwhile, the government is issuing more licenses for wireless broadband services to increase internet speed, which currently only averages 128 to 512 kbps. Teacher training on ICT use in the classroom is also necessary, including exposure to ICT-based interactive instructional design. Seok-Yong (“SY”) Yoon is Principal Public Management Specialist (e-Governance) at the Digital Technology for Development Unit, the Sustainable Development and Climate Change Department at the Asian Development Bank. He is focal person for ICT and digital development operations. Mr. Yoon has led number of digital development and eGovernance projects as a project officer and organized various internal and regional knowledge events for the better use of digital technology.